Meet Joshua James, the fix-it man. 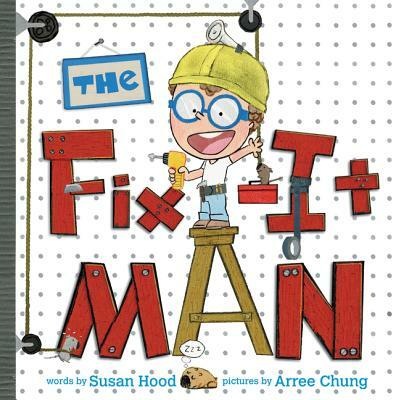 If he can’t fix it, no one can! When a stinky problem arises, Joshua James takes matters into his own hands with a little help from his younger sister, Sophie. This playful read-aloud story with catchy text and imaginative illustrations is sure to inspire young inventors everywhere. Susan Hood is the author of more than two hundred children’s books, including Ada’s Violin, the 2017 winner of Bank Street’s Flora Stieglitz Straus Award, given annually to “a distinguished work of nonfiction which serves as an inspiration to young people,” and the acclaimed Shaking Things Up: 14 Young Women Who Changed the World. Visit her at www.susanhoodbooks.com. Arree Chung is a maker, which means he breaks a lot of things before putting them back together again. He is also the author and illustrator of the Ninja! series. When Arree isn’t breaking things or making up stories, you can find him riding his bike or playing basketball in the Bay Area of San Francisco. Visit him online at www.arree.com.